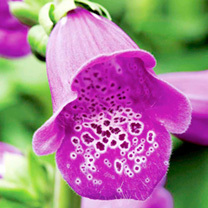 A cottage garden favourite, renowned for their towering spikes of tubular flowers. They'll make an impressive statement at the back of a border and are ideal for woodland or wildlife gardens. Deadhead after the first flush of flowers to encourage re-blooming! Dalmation Purple - Thimble like flowers that open upwards from the base of the spike. Flowers June-September. Height 80-90cm (32-35"); spread 20-30cm (8-12"). Supplied in a 9cm pot. Giant spikes of speckled flowers in their first year! Ideal for beds and borders. Attractive to bees. Prefers full sun or partial shade.